Greenwood, SC. 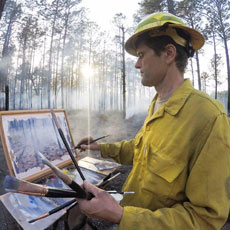 Eighteen years ago, USCOG’s Rick Green became a founding member of the Upper Savannah Land Trust (USLT), whose mission is to encourage and support conservation of natural and scenic lands, farms, forests, waterways and open spaces in the counties of Abbeville, Anderson, Edgefield, Greenwood, Laurens, McCormick, Newberry and Saluda. “It’s remarkable to think the Trust began 18 years ago with a 13-acre easement and today holds under easement nearly 50,000 acres over eight counties,” USLT Board member Frank Wideman said at the organization’s annual meeting March 22, 2018. Green, who is USCOG’s Government Services Director, has helped lead the Land Trust from its humble beginnings to what has now become a nationally-accredited organization with 47,562 acres (147 easements) protected for future generations. The USLT has an office at Upper Savannah COG. 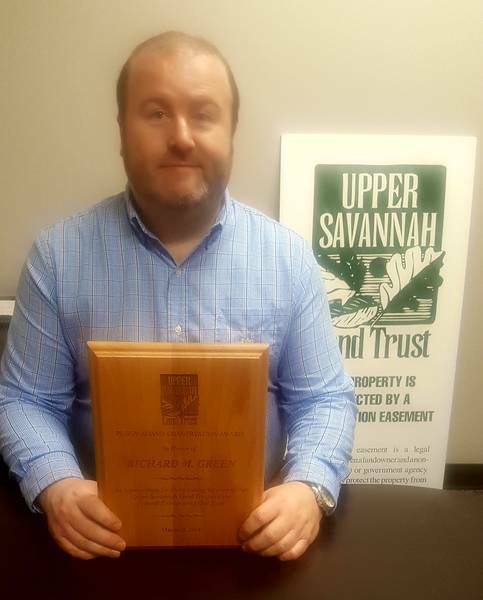 The USLT honored Green with the Peggy Adams Conservation Award at the annual meeting. Wideman said Green’s leadership was especially critical in the early stages of the USLT’s development. Green has served as the organization’s secretary for all 18 years. A conservation easement is a legal agreement between the landowner and land trust, enabling the landowners to put permanent restrictions on their property. It guarantees that future generations can enjoy the special qualities of the land without the fear of commercial development.